For all the effort I put in a couple of weeks back, organizing and updating the many, many MMOs I thought I ought to be playing, right now I find myself sticking firmly to some very well-established favorites. Most days I move between Guild Wars 2 and EverQuest II with scarcely a glance at anything else. What's more, even within those two familiar worlds, most of what I'm doing is stuff I've done before. Often. Maybe it's the time of year (January is statistically proven to be the most depressing month, if by "statistically proven" you mean "paid to say so by a travel company") but nothing seems quite so appealing at the moment as settling down for a session of tick-box questing while leveling up a new character against a familiar backdrop. Either that or holiday events. 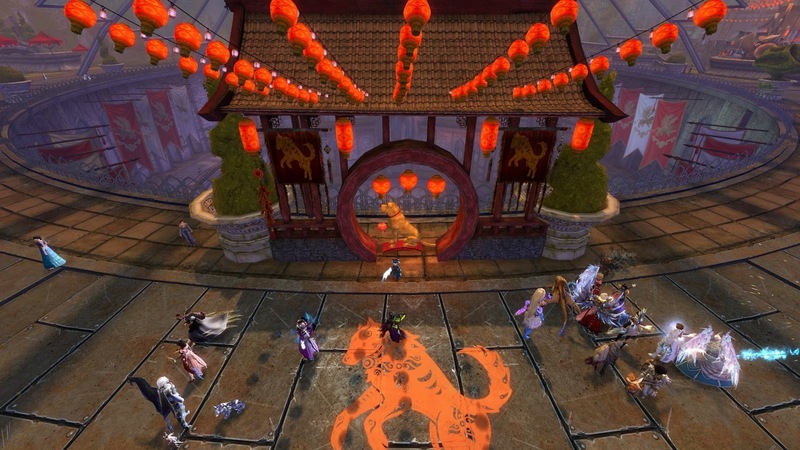 GW2, which has taken six years to develop something vaguely resembling a balanced Holiday calendar, comes out of Wintersday into Lunar New Year with scarcely a breath. I like Lunar New Year although, like all Tyrian celebrations, it's thin on content when compared to the holidays on offer in other MMORPGs. ANet have at least rowed back a touch from their stated intent to keep all holidays the same forever because that's what people want. I exaggerate but not by much. The concessions to novelty these days generally come from two sources: a new racetrack or another version of an event that already exists. This time we got the latter, a timed "adventure" to set light to a new set of firecrackers around Divinity's Reach. I tried it once and it looked like a lot of effort so I stopped. So far I haven't bothered to try again. This is from last year's festival, Year of the Dog. This time it's the Boar's turn. Otherwise not much has changed. I also haven't been strict about the festival dailies, I do them if I'm in the mood. I love the race, so if it happens to start when I'm there, I'm in. Since I have characters from four accounts parked in Divinty's Reach, ready to buy the permitted sixteen Lucky Envelopes every day and the race starts every twenty minutes, that happens quite a lot. The Lucky Envelopes are my favorite part of Lunar New Year. They are lockboxes that cost a gold apiece. You can only buy sixteen, per account, per day from an NP but they're tradeable, so if you want more you can buy from other players via the Trading Post. Currently they're trading for almost 50% more than the NPC cost, so it's a very good way to make a few gold. I open all mine. It makes less money but it's a lot more fun. Magic Find affects these envelopes so I make an effort to get mine as high as possible before slitting the seal. The highest I've managed so far is 598%. If it makes any difference I can't see it. It was the envelopes that got me to log in my rarely-played free account yesterday. I wanted to see if F2P players can buy them (they can) and sell them (they can't). Since my sum total of wealth on that account was 17g it's probably going to be a one-off experiment. Oh, I don't know though. Maybe I'll gamble my only F2P character into destitution for the hell of it. That's what lockboxes are for, right? She oughtn't to complain if I did. She had the best runaround she's had for months yesterday, courtesy of the holiday celebrations. She opened envelopes, ran the race on a rented raptor, lost two rounds of Dragonball, badly, and set fire to the requisite ten strings of firecrackers. You can tell I was having a good time. This is literally the only screenshot I took in four hours. That got her more Achievement Points than she's seen in a very long while. I was enjoying playing her so much I carried on to the regular dailies, which put the two gold she'd lost on the envelopes back in her bags. Speaking of bags, I noticed she was still using a four-slot dropped bag in her third and last bag slot. Bag slots are very restricted for free accounts, unless you buy more for Gems, but you can put any bag you can find in the slots you have. There's no excuse for a four-slotter. That led me to try to farm leather from animals, like I did in beta seven years ago, so she could make an eight slot bag with her minimal leatherworking skills. Farming animals for leather doesn't work. It probably never did. I'd forgotten. Lack of drops led me to doing a bit of research online, which in turn led to me first to hunting centaurs for the bags they drop, which often contain scraps to salvage into leather, then to deciding to change crafting profession altogether, because you can mine copper for Bronze strongboxes with orders of magnitude more efficiency than you can farm leather for bags. I ended up doing map completion in Wayfarer Foothills. I played my free account for over four hours, did three levels and eventually even made that eight-slot bag. It was all to no purpose whatsoever, other than that I was having fun. I already have three perfectly good accounts and three is probably already one more than the ideal. I definitely don't need to be working on a fourth, but as I've discovered many times in the past, low level play can be both pure pleasure and highly addictive. Dragon afterlife: sit in the same place all day, every day; hand out quests, when asked. It's a living. Or not. What's more, the restrictions companies impose to make "free" a less attractive option than paying money, frequently work in reverse where my psychology is concerned. I like being restricted to just three bags and two character slots. I like not being able to sell most of my stuff to other players. I like not being able to do certain things until I reach a certain level. Or, more accurately, I like the way these arbitrary restrictions foster an ersatz impression of playing the game as it was almost seven years ago, when money was so hard to come by I took a screenshot of my inventory when I got my first gold coin. Crafting mattered then; you could make better gear than you were wearing without it feeling like an artificial grind (looking at you, Ascended and Legendary). But drops mattered just as much because that's where most of your upgrades came from. Yesterday felt like that. So did the forty levels, sixty to a hundred, I've put on my EQII Bruiser in recent weeks. Yet, it doesn't explain why I took him through almost all of the Vesspyr Isles timeline and much of Kunark Ascending, even though neither gave him much xp or any gear he could use. I did those because I was enjoying the questlines. Even though I'd already done them on my Berserker. I was enjoying the writing, some classic EQ2 questing, a particular flavor not replicated anywhere in MMOs that I've found and, no doubt, something of an acquired taste, but I was also enjoying the extreme ease of the entire experience. The first time I worked through both of those narratives it was satisfying and entertaining but it was also quite slow and... well, I won't say "difficult" but it certainly wasn't a gimme. This time I was gleefully one-shotting most things and two-shotting the rest. Far from trivializing the experience, it enhanced it. You wouldn't believe the trouble I had getting in to see this guy. What is it with Necromancers and towers? I wouldn't re-do these storylines at the same pace I did them first time round. The very prospect makes me shiver. Doing them at a brisk canter, though? That's entertainment. 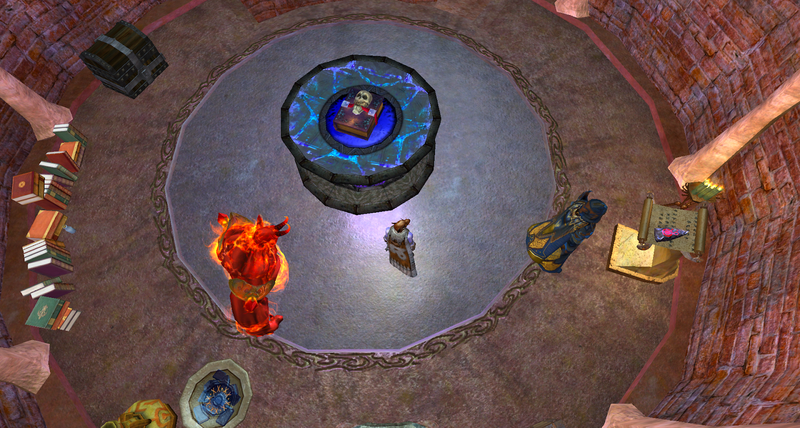 Even the last ten levels from 100 to 110, where changes in game design mean there's no longer any real choice about where to level up, (it's Plane of Magic or go home, basically) are made not just palatable but tasty by the immense decrease in difficulty that comes with EQII's relentless power creep. My Bruiser's sitting at two-thirds of the way through Level 107. He'll be 110 in no time. 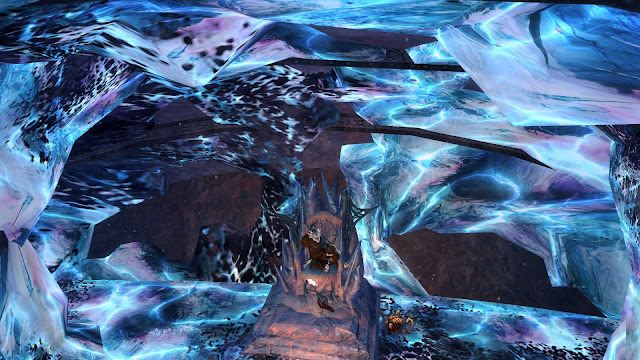 Meanwhile, my Berserker, the only one actively working through current solo endgame content from last November's Chaos Descending expansion, still has three instanced dungeons and the finale to go. I took him through an instance last Friday. It took about two hours and had to be completed in one sitting or progress would be lost. It was fun but I wouldn't call it relaxing. He'll get there in the end. With another expansion announced for this year he'll need to be ready. Chances are, unless some Live events raise the power levels yet again, he'll be the only one who is. The rest of my max levels - and there will be at least four of them, maybe as many as six, will be waiting for the bar to be lowered yet again. Once through at original difficulty is enough. I suppose all of this is what some people call "comfort gaming". I don't really think of it as "comfort" so much as "satisfaction". It's much the same feeling I get when a fresh game clicks and playing a brand new MMORPG is rarely "comfortable". You start out with nothing, knowing even less. For a while, sometimes a long while, everything is a struggle. Then only some things. Then hardly anything at all. That upward slope is where the comfort lies, if comfort's what it is. Whatever it is I'm looking for, I'm not likely to find it resting on the plateau at the top but on the journey up, climbing the path to get there. And it's not the repetition and the familiarity that bring comfort, or not only that; it's the certain knowledge that things can only get better. Who wouldn't find that comforting? That sounds somewhat like me, only I don't bother with the new games very often. 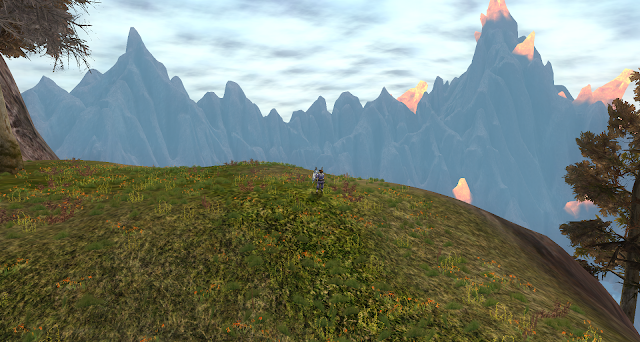 I just wander from one old MMO to another and potter about, often doing things I have done before. I have found a good deal of satisfaction in the LOTRO Legendary server, in part because I have been retracing well worn steps and in part because I have expanded the boundaries of what I have accomplished in the game. That will wear out though. There is some invisible yet tangible limit that I will cross over and feel as though I am done. But EQ will be doing some special things soon enough, so I will likely wander over there next. I would like to get stuck into a meaty, new MMORPG but they're pretty thin on the ground these days, so it's just as well I find going over old ground so endlessly entertaining. I probably already have more than enough MMORPGs I really enjoy to keep me entertained as long as I'm likely to need it, which is a comforting thought. Why do you feel that GW2 holidays are thin on content compared to other MMOs? I struggle to remember any MMO where I've seen more activities on holiday. With only a few very small variations each year, something ANet made clear was a key part of their design philosophy, not a resource issue, the Holidays don't grow in the way holidays in other MMOs do. Look at this for example. That's hours of content before you even start on the repeatables. GW2 does have good repeatable holiday content, though. Things like the races, Dragonball, the Bell Choir, and, of course, the Mad king's Labyrinth can be played ad infinitum. What's missing is narrative content. It's a different approach, I guess. It always feels content-light to me because when I think of content I tend to think of quests, which in GW2 would equate to event chains or collections. Don't get many of those for holidays and certainly not new ones every time. The link was interesting, thanks. I admit I never played EQ2, so this kind of attention to festivals is a novelty. Still I think GW2 has pretty healthy festival content compared to WoW (the same list of one time achievements everyone gained 10 years ago, when they were first introduced, few dailies and boring one boss dungeon that drops mount with 1% probability), FFXIV (bunch of fetch quests) or SWTOR (Cartel Market discounts). GW1 was better, but sadly population isn't the same. As for narrative, GW2 festivals are in line with GW2 narrative in general where most of it is told through NPC idle dialogue. Of the games I've played the price for the shortest/least holiday content has to go to FFXIV. You're pretty much done after 15 minutes or so per character. At least it's something new every time, but you can only do that, not the old stuff. Don't really like that approach tbh. I like doing whatever's the most fun at any given moment too. Who cares if I've done it before or if it's 'meaningful' progress? Games are for fun, so when I'm having fun I'm doing it right I feel. Yes, FFXIV's holidays are strange. There always seem to be a lot of catgirls in bikinis, somehow, or maybe that's just me. I can never do more than 2 MMORPGs at a time. I'm going through ESO now, and it picked up once I got past level 35 or so. And for some reason, I just don't get into holiday content like I used to. I didn't even try getting into the latest ESO holiday stuff. Too busy exploring brand new content, I guess. I like to dip in and out of holiday stuff. I usually finish whatever is new and then cheryy-pick my favorites and/or things that give rewards i want. Even then I often get distracted and wander off before I finish. Nice to have the option, though.